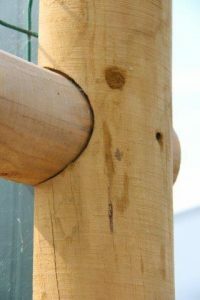 For more than 30 years, M&M Timber has built its reputation on the manufacture and supply of quality timber products. 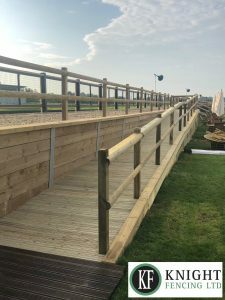 Automation meets Automotive for latest timber viewing platforms at Goodwood. 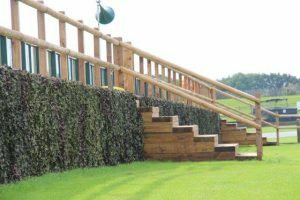 M&M Timber utilised their state-of-the-art CNC router machine to create precision machined components for new spectator viewing platforms at the world’s most prestigious classic automotive circuit, in conjunction with leading fencing contractor Knight Fencing. Nestled at the foot of the Sussex Downs, with the sea often visible just a few miles in the distance, Goodwood Circuit is a historic venue for both two and four-wheeled motorsport in the United Kingdom. The 3.8-kilometre (2.4 mile) circuit is situated near Chichester, West Sussex, on the estate of Goodwood House. 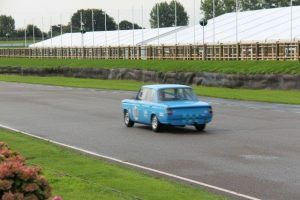 The track is the only classic circuit in the world to remain entirely in its original form, after being lovingly restored over a six-year period, in preparation for the inaugural Goodwood Revival of 1998. 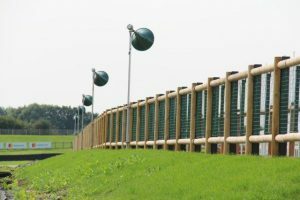 Goodwood Motor Circuit was officially opened in September 1948, when Freddie March, the 9th Duke and renowned amateur racer, tore around the track in a Bristol 400. He received a rapturous response from 15,000 spectators who had come to the opening of Britain’s first professionally organised post-war motor-racing event. 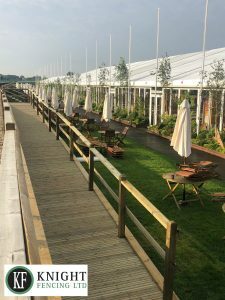 It is now renowned as England’s greatest sporting estate and home to three of the biggest sporting events in the world: The Festival of Speed, the Qatar Goodwood Festival and the Goodwood Revival. 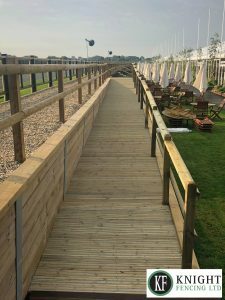 To date, M&M Timber (a division of the Forest Garden Group) have supplied 4,000 linear metres of timber to Goodwood – which put end to end would span the total length of the circuit itself. 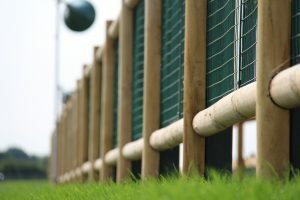 M&M Timber sourced the timber from well managed forests and using their state of the art Kimla CNC router machine at their Worcestershire sawmill, the timbers have been scalloped to give a bespoke and aesthetically pleasing barrier from which members of the public can view the action. 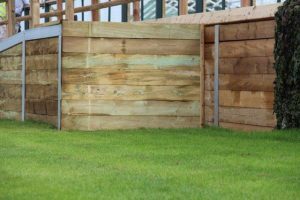 In addition to the round timber solution, M&M Timber has also supplied their rough sawn DuraSleeper which can be used in a variety of configurations to create edging or walling features. 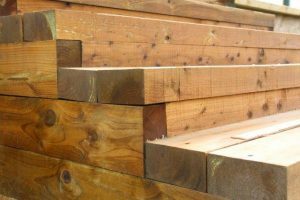 At Goodwood, the sleepers have been used to create steps and access ramps to the race track viewing area.